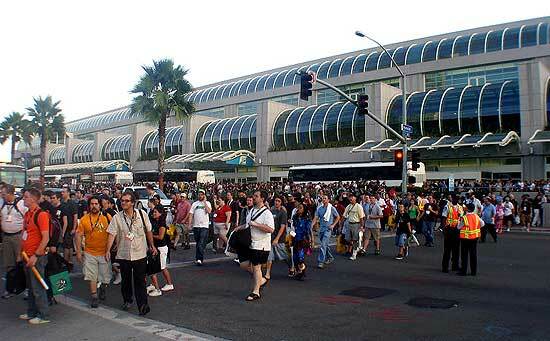 Action Figure Insider » San Diego Comic Con International 2006! Well, we’re trying something a bit new this year here at AFI. After spending the past 6 or 7 years being beaten down by the glory and the chaos that is SDCC, I (Jason ‘ToyOtter’ Geyer) am staying behind to man the fort while our intrepid team (Daniel ‘Julius Marx’ Pickett, Cuban Zod, and Mike ‘SDComics’ Walker, along with a few friends and colleagues) will send back reports and pictures from the con floor. With any luck we’ll be able to update more frequently than if we were all there. Helping me tremendously in keeping the fort secure is the rest of the team: Ryan ‘The Superfly’ Prast, Jeff ‘Jeff’ Cope, and Darren ‘Dare’ Chia. So check back here throughout the four days of the convention, and take a gander at our special SDCC forums set up for all sorts of discussion. Daniel will also once again be moderating his famous toy panels, so if you hit the con be sure to go check them out! For more good coverage and pictures, the only places you need to go visit are Fwooshnet, Raving Toy Maniac, Action-Figure.com, Rebelscum, and YoJoe.com . Now on with the show! Click Here to go to our full SDCC 2006 Coverage!